For the 24 hours to 23:00 GMT, the EUR rose 0.28% against the USD and closed at 1.1583. In the US, data showed that the US NY Empire State manufacturing index climbed to a level of 21.1 in October, more than market consensus for a rise to a level of 20.0. In the prior month, the index had recorded a level of 19.0. Moreover, the nation’s business inventories rose 0.5% on a monthly basis in August, at par with market expectations. Business inventories had recorded a revised gain of 0.7% in the preceding month. Additionally, US advance retail sales jumped 0.1% on a monthly basis in September, following a similar rise in the previous month. Market participants had anticipated for advance retail sales to rise 0.6%. In the Asian session, at GMT0300, the pair is trading at 1.1574, with the EUR trading 0.08% lower against the USD from yesterday’s close. 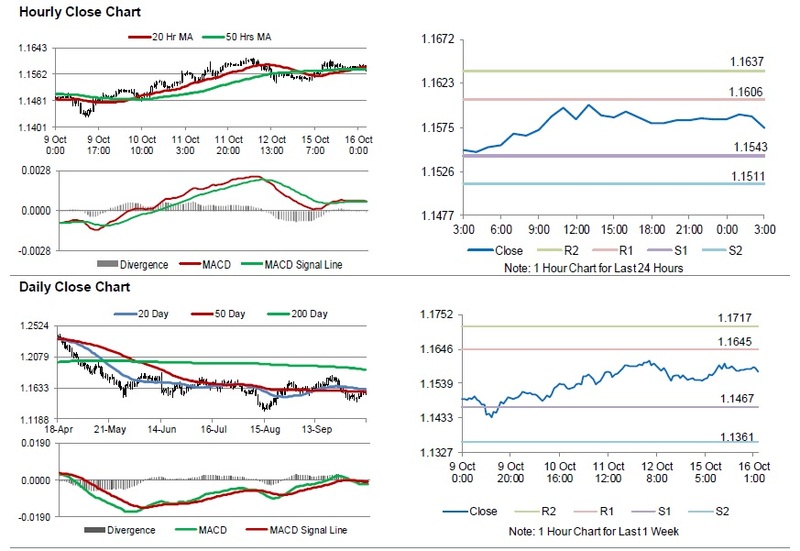 The pair is expected to find support at 1.1543, and a fall through could take it to the next support level of 1.1511. The pair is expected to find its first resistance at 1.1606, and a rise through could take it to the next resistance level of 1.1637. Looking forward, traders would await the Euro-zone’s trade balance data for August and ZEW economic sentiment for October, followed by Germany’s ZEW current situation for October, all set to release in a few hours. Later in the day, the US industrial production for September and NAHB housing market index for October, will garner significant amount of investor attention.